For eight years Debra DiBenedetto’s students have marveled over the “cycle of life” in her Dixie Outdoor Classroom. In the fall they replace the non-native brush with native shrubbery. In the winter they build willow walls to minimize the erosion along the banks of Miller Creek. In the spring they nurture their blossoming natives. Over the years, the Dixie Outdoor Classroom, with the labors of the hard-working Dixie Elementary School students, has evolved from a briar patch of non-native, Himalayan blackberry bushes to a nature preserve featuring numerous native, drought-resistant plants. The Dixie Outdoor Classroom, situated on the banks of Miller Creek, provides the Dixie Elementary School students an opportunity to study the change in seasons in a natural setting. Second-grade teacher Debra DiBenedetto brings an awareness of the environment to her students. She shows her students what nature teaches us about our environment. She shows them how important it is to restore and protect our natives, how they support our environment and how their loss impacts our lives. 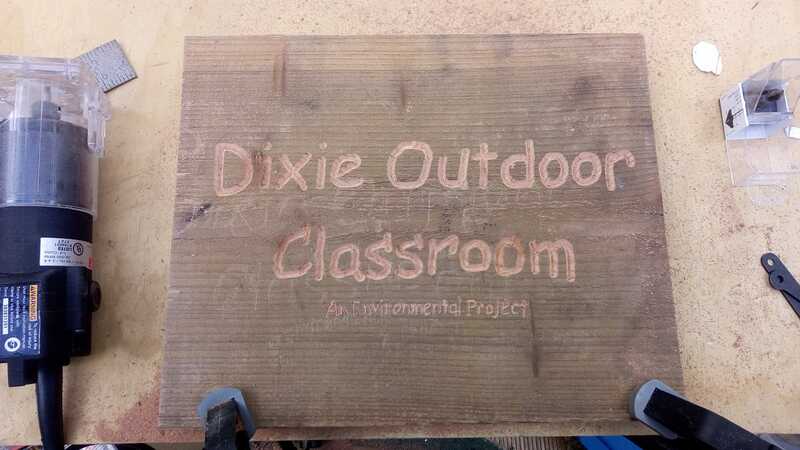 Their study and environmental practices has effectively returned the Dixie Outdoor Classroom site to its natural state. Her work has shown her students that by restoring the land with native plants, insects thrive, birds return and animals migrate back to their native surroundings. Recently an otter was spotted and an egret was seen on the banks of Miller Creek at the Dixie Outdoor Classroom. Families of quail are common sights. Numerous steelhead are easily seen in the creek. And, of course, the sly fox has been seen prowling the area. Over the years, DiBenedetto’s students, after graduating to higher education levels, have returned to participate in maintaining the Dixie Outdoor Classroom. Some of them return while attending Miller Creek Middle School. And more recently some of her former students who now attend Terra Linda High School have returned to help. Her students have become life-long stewards of the environment. With the support of the Miller Creek Watershed Stewards, DiBenedetto has received funds from multiple grants enabling her to provide a better environment for her students. They no longer need to sit on the ground while listening to her provide instructions for the day’s activities. They can now sit on benches. And they have a Tuffshed to store the tools needed to do the work required for creek restoration, removal of non-native plants and soil preparation for native plants. Funds to provide the native plants, tools, equipment and facilities have been provided by grants from Marin County’s Fish and Wildlife Commission. Funds have also been provided by the Marinwood Lions Club’s Kelly’s Wishes Grant and the county of Marin’s Community Services Fund. The kids love to climb into their large knee-high bright yellow boots and wade into Miller Creek while working on the creek’s restoration. The Miller Creek Watershed Stewards and the local community have provided the more taxing manual labor to clear the invasive blackberry, remove the dead trees and cut back the congestive ivy. Numerous photos portraying the Dixie Outdoor Classroom activity can be viewed on the website at millercreekwatershedstewards.org. This spring some non-native plants have returned and the restoration cycle is being repeated. The students will be replacing the non-natives with native Marin plants. They have planted a large variety of natives which include California wild rose, thimbleberry, blue blossom ceanothus, coffeeberry, snowberry and coast live oak to mention a few. DiBenedetto’s Dixie Outdoor Classroom offers her students a hands-on, healthy, fun, outdoor experience to learn the fundamental benefits inherent in returning our environment to its native state. Ray Lorber, of San Rafael, is chairman of Miller Creek Watershed Stewards, an 11-year-old organization that works to protect Miller Creek.